South Asia is currently in a vortex of a very defining election season. In India, though the General Elections are still 10 months away, the country has already started discussing the possibilities and predicting the outcome expected in 2019. The main question dominating all discussions is whether Indian Prime Minister Narendra Modi will emerge victorious for a second term. At stake next year in the world’s most populous democracy is the idea of India itself. Will the polls ensure the defeat of the divisive forces currently at work, or will we see further consolidation of the majoritarian agenda? In the meantime, the upcoming General Elections in Pakistan have also been occupying the minds of many Indians. With new twists and turns unfolding every day, New Delhi is quietly watching the saga unfold in the nascent democracy of Pakistan. The foremost question in the minds of many Pakistan-watchers in India is regarding the fate of Nawaz Sharif and his party, as we wonder what the consequences will be of the political marginalisation of the Pakistan Muslim League-Nawaz (PML-N) on the Indo-Pak relationship. For many Indians, it is surprising that Islamabad is witnessing a smooth democratic transition for the second time in the past decade. It breaks some of the deep-seated prejudices and preconceived notions that Indians have about Pakistan and its polity, as a majority of Indians believe democracy is an anathema to Pakistan, and that it cannot be governed by a democratically-elected government. For Indians – fed mostly by a visibly biased media – our western neighbour lives and thrives in chaos. But two back-to-back elections and democratic transitions present a new image of Pakistan to most Indians. Many in India are also quite keen to know whether Imran Khan will be lucky this time around and finally become the prime minister of the Islamic Republic – a position he clearly desires. But if one were to ask who India is batting for, but not actually betting on, then Nawaz’s PML-N would be the instant favourite. It’s not that Nawaz is seen as a messiah among the Indian people, but he is looked upon as someone who is pragmatic and an ardent believer in engagement and dialogue. Some commentators in New Delhi believe the Indian premier chose not to take the opportunity presented to him by Nawaz, which would have allowed the Indo-Pak relationship to reach a level of cordiality it greatly needs. Many peaceniks in New Delhi believe Modi failed to reciprocate the gesture that Nawaz showed towards him when he came to attend his swearing-in ceremony in 2014, despite domestic political constraints. Thus, Nawaz enjoys a good image among the Indian masses, unlike many of his political competitors, and because of that so does his party. His political travails in Pakistan are discussed widely in the Indian media, particularly due to a recent interview, and popular opinion suggests he is more sinned against than sinning. There is also the belief that he has staked his political career for peace in the subcontinent, and therefore his party is best suited to maintain peace in the region by ensuring peace between Pakistan and India. On the other hand, despite enjoying immense popularity in India, Imran suffers from a trust deficit amongst its populace. Conservative or liberal, most Indians generally feel Imran is not a good bet for peace in the region. He is seen as a man backed by the establishment, who would play hardball with New Delhi in order to stay relevant in politics. Some commentators also argue that Imran coming into power would lead to an escalation in the situation in Kashmir, whereas the efforts to stabilise Afghanistan will meet a dead-end. What makes Imran an anti-hero in India is his political hobnobbing with extremist elements and his open challenge to progressive politics. Therefore, Indians are not so sanguine about a peaceful atmosphere in the subcontinent if the Pakistan Tehreek-e-Insaf (PTI) leader comes to power in the upcoming elections. Interestingly, no one in the Indian media is willing to discuss even the possibility of the Pakistan Peoples Party (PPP) winning in the General Elections. At a time when India is deeply polarised on the issue of Modi most likely winning another term in office, added complexity and deepening uncertainty in Pakistan’s electoral politics would only further confound the countrymen. Therefore, many liberal thinkers and peace-lovers in India would like to see the end of Modi’s regime in India, but the continuation of the incumbent in Pakistan. The reason is obvious: the former is seen as an anti-peace politician, while the latter is looked at as a pragmatic administration that believes in dialogue and engagement. Undoubtedly, the upcoming election is very crucial to the political fate of Pakistan, and for Indians, the regime change in Islamabad is not just a matter of curiosity – it is paramount in directing the fate of the subcontinent. The blogger is a journalist from India. The views expressed by the writer and the reader comments do not necessarily reflect the views and policies of The Express Tribune. India’s undeclared emergency: Dear BJP, arresting a citizen for calling you ‘fascist’ makes you… a fascist! Want to be a hero in India and get recognition in a movie? Go to IoK and kill a Kashmiri! #JusticeforAsifa: Has India discarded its moral compass? Mr Arora lets just get the facts right. History proves that PK has always extended a hand of friendship towards India. Your country has shunned it because it does not want to talk about Kashmir. Further, you conveniently ignore that Benazir Bhutto in her naivety hoping for peace with India gave away a list containing names of Indian Sikhs. Your government used it as you kill-list. Not one of those the list is alive today. Furthermore, your government lost the best chance it has had in 70 years of PK-Ind history to resolve the Kashmir issue. Your military establishment was too short-sighted and had Musharraf’s plan rejected. So sorry, but your Hindutva swamped facilities fail to see Mr. Arora’s reasoning. like you. Is that the Bajrang Dal song resounding in your ears? Or is it Jai Hind? Well, there is Modi Sarkar, your Saffron Lord, also known as The Butcher of Gujrat. With the blood of more than 2,300 massacred Muslims on his hands. 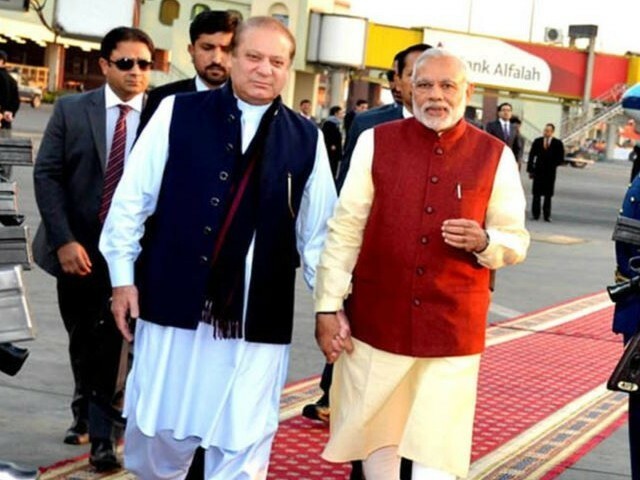 It’s not complicated as it seem to be, its very simple for india supporting nawaz, one he is the friend of a hindutva leader modi and his soft approach respon or silence for the hindu hardliners that hate Muslim of india, lynching of innocent muslims and the barbarism and brutality toward kashmiris. A biggest reason india wouldn’t want this country to have a sincere leader that stand firm against them on every platform with iron arms, make pakistan stronger in every aspect, progress and prosper this nation, India want pakistan to be stuck under the rule of these senseless looters such as nawaz zardari or any other corrupt regimes so indians can keep us under their arms weak incapacitate and debilitated. Right now these two nawaz zardari regimes and their entire teams are the worst corrupt looters in the history of pakistan. Their own and their cronies bank balances are skyrocketing and the poverty in this country are destroying the lives of millions. very unfortunate to see that some people even taking away their own lives and their loved one, million people suffer serious deprivation lack of food and hunger and two plunderers families and their cronies are playing with billions living like king in their palaces in foreign developed countries such as london dubai or usa or even in pakistan. their only interest is for their families and themselves. this is a greatest happiness for the enemy country that we remain under these brutal corrupt inhuman mafia and suffer continuously. India fear is with sincere honest leader this country pakistan will prosper and with prosperity this country economy and defence will become the strongest. even a kid knows india would not digest this prosperity for our country since they know strong pakistan is not in their interest. Why’d a Indian speak from Pakistan narrative i mean neighbors how is india neighbor for author . For Pakistani very few India even don’t know there is a Hyderabad in Pakistan let alone geo politics is not something common in our society except you’re political student even they study mostly on west. Is Venezuela the new Afghanistan? This material may not be published, broadcast, rewritten, redistributed or derived from. Unless otherwise stated, all content is copyrighted © 2019 The Express Tribune News Network.